Keta is a large saltwater fish of the family of Pacific salmon, with red meat and pleasant taste. Keta meat suitable for pickling, frying, but very tasty and tender is the result of Smoking. However, before Smoking fish it is necessary to properly pickle, so it was not hard and dry. - 700 ml of water. To prepare the salmon for Smoking and pickle at home is quite simple, you only need to choose the right fish and proportioning of ingredients. Choose whole carcass with head. Even if you spend more time on cutting the fish, you will be sure it is not spoiled. Buy salmon frozen only once. To distinguish repeatedly frozen fish can be in appearance, good chum should be intact, with smooth fins. Be aware that frozen fish loses flavour properties, however, it is best to buy fresh salmon. Now proceed to self-cutting of fish. Initially, separate the head from the carcass, remove the fins and tail, and then by longitudinal incision from the head to the tail gut a fish by removing guts. Make cuts left and right of the spine and relieve salmon from the bones. If you have a large fish fillets, you can cut it into two pieces. If desired, peel the salmon from the scales and to separate the skin from the loin, but the taste is not affected. The most common way to pickle salmon house is the brine that allows you to control the degree of salting and the softness of the fish. In a saucepan boil water, then add ground pepper and peppercorns, and crushed Bay leaf, stir well and keep on low heat for about 5 minutes. The brine cool at room temperature. In a glass, enamel or plastic container, put fillet and pour over the fish with the brine, then cover the container with a lid and place in the fridge for 10-15 hours. Try not to use metal prosody for pickling, because the metal is able to give the fish a bad taste. If you have little time and need a quick pickle chum, then use the recipe for quick pickling. Disassembled fillet cut into large slices and put in a plastic, enamel or glass container. In another container prepare the brine, 500 ml of water and salt, then pour this brine the fish, cover the bowl with a lid and put a heavy object on top as oppression. 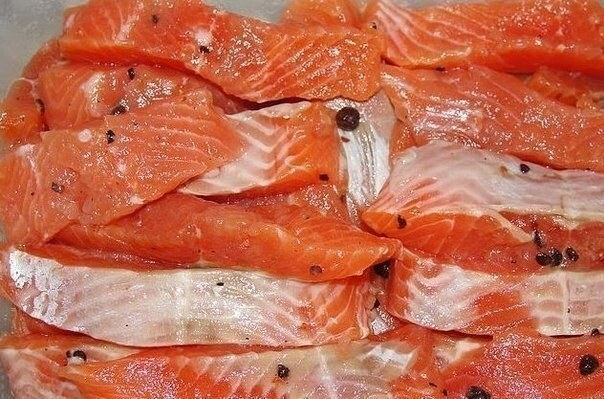 Chum salmon must zaselyatsya 1.5-2 hours at room temperature. Mix the vinegar and 200 ml of water, pour the fish for 10 minutes, and then drain the liquid. Onions peel and slice rings, and then mix with other spices (pepper and Bay leaf), pour over olive oil. Oil used for fish was not too dry. In this mixture, put fillet chum salmon, stir and leave for 15-20 minutes. After the specified time chum quick pickling is ready and it can be used for Smoking. When selecting spices for pickling chum salmon stop the choice on coarse salt, which will perfectly interact with the liquid from fish. As spices you can also use black pepper, black pepper, dried parsley, cumin, coriander etc. have to be a requirement of moderation, because spices should only emphasize the taste of the fish fragrant additives, and do not drown.